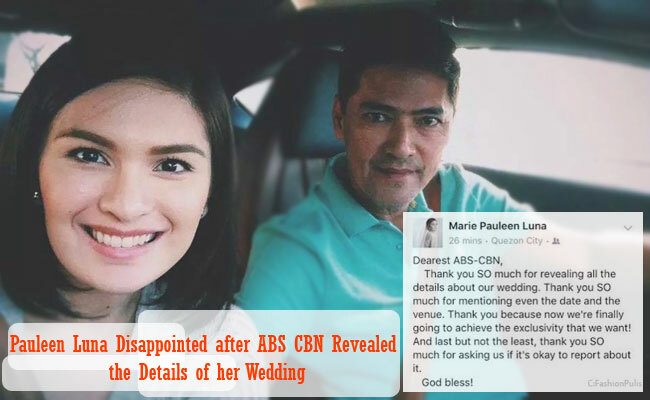 When GMA artists Vic Sotto and Pauleen Luna announced their engagement, they also clarified that they wanted a private wedding to keep the ceremony intimate, however it seems that some media had leaked some valuable details that made the bride upset. It was late September when the couple broke the news of their engagement and while many wanted to catch the details of the upcoming personal event in the lives of the two celebrities, Luna shared that the details will be revealed in God’s perfect time. Some thought that it would be on the second week of 2016, but this was not even confirmed. Then suddenly, in a Facebook post, Luna shared her disappointment after she learned that an ABS CBN report had revealed more details than she wanted the public to learn. The Eat Bulaga host sarcastically cried foul with her post, but it was soon deleted. In her post, the actress sarcastically thanked the Kapamilya network for revealing the details of their wedding’s venue and date. She even hinted that the network did not even ask if it was fine to post the details. According to Mario Dumaual, the information came from Luna’s manager, Lolit Solis. Recently, the wedding’s entourage was revealed and many news sites picked up the update, yet the actress specifically requested not to reveal certain details to keep the ceremony intimate. The couple even planned to share the last minute details in their noontime show Eat Bulaga in GMA network.